The latest row involving Jeremy Corbyn and Jewish people has been raging for more than two days now. 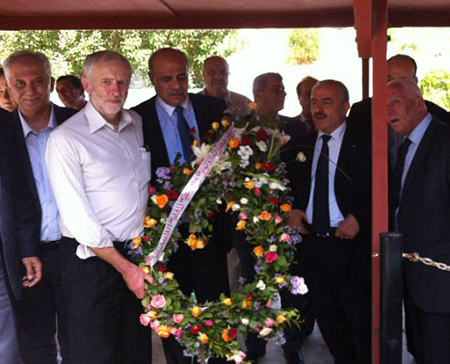 On Saturday the Daily Mail published an article with photos of Jeremy Corbyn involved in a wreath-laying ceremony at a cemetery in Tunisia where members of the Black September terrorist group are buried – the group responsible for the murder of Israeli athletes in Munich in 1972. "I was present, but I don`t think I was involved." So strong are the feelings involved in this that the Labour leader`s attempt to calm the anger provoked by the photos has been described by a member of the Labour Party as "a further insult to those savagely murdered at Munich and their bereaved relatives." The row was further aggravated by a video clip shared on Twitter in which Jeremy Corbyn says that Palestinians in the West Bank live "under occupation of the very sort that would be recognised by many people in Europe who suffered occupation during the Second World War." `Israeli PM @Netanyahu`s claims about my actions and words are false. Apparently, Mr Corbyn is ignorant of the parallel basic law that the Palestinians have prepared in the hope of being given their own state. They go on to note that when Jeremy Corbyn`s reply to Benjamin Netanyahu is taken into account, this represents a unique moment in politics. Sadly, this unique political moment indicates that there is now open hostility between the Leader of the Opposition in the UK and the Prime Minister of Israel. Such hostility does nothing to help the cause of peace.